Outreach email templates are the messages that you mass email to the leads listed in your outreach campaign. 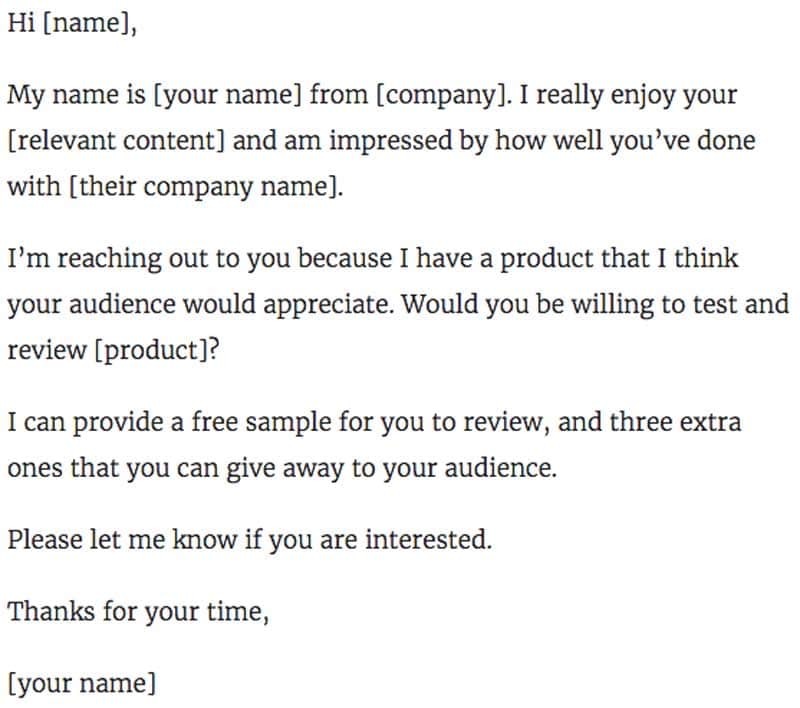 These messages should explain the purpose of your outreach, whether it's to get a backlink, product review, guest post, or other. For these messages to be effective, they should be clear, concise, relevant, and persuasive. 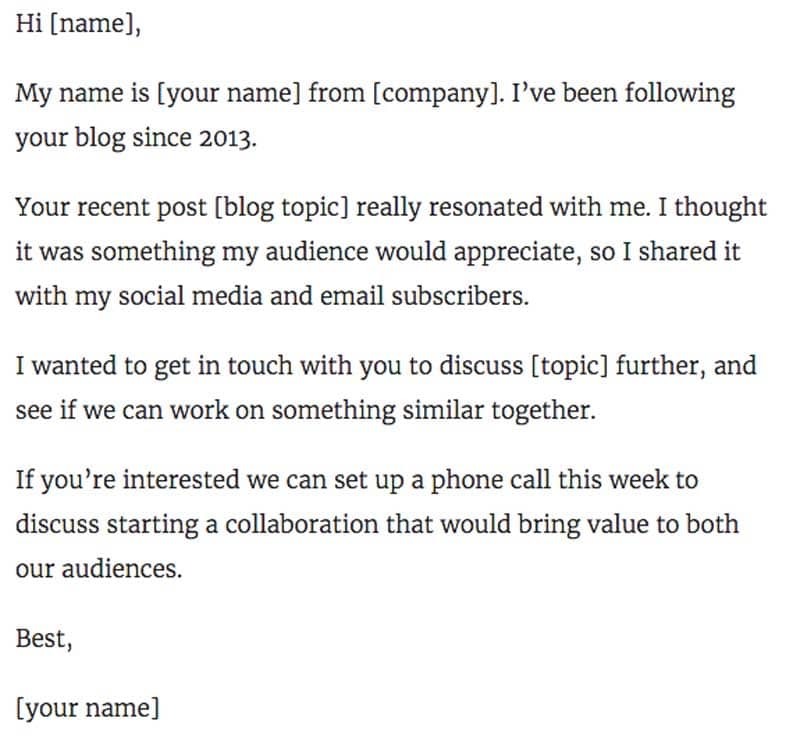 So it should be pretty obvious how crucial your outreach email templates are when connecting with influencers. Perhaps that’s not the saying, but it should be. If you want to work with an influencer, you’ve got to have a killer pitch. My team has worked with thousands of influencers on a range of projects, and we’ve learned that having the right outreach email can make or break your influencer campaign. Below, I’ve compiled a summary of the approaches that have worked most effectively for us. We’ll start with the quintessential influencer outreach email. Many brands already have a wish list of influencers they want to work with, and they’re willing to work with them however the influencer sees fit. Your brand would be equally happy with a single sponsored post, a long-term Instagram campaign, or whatever else the influencer may have in mind. In this case, you’ll want to send an open-ended email to determine the influencer’s availability and rates. Aaron’s template does a lot of things right. He compliments the influencer’s latest work and demonstrates genuine interest by mentioning he’s been a fan since 2013. It’s also short, sweet, and to the point. It’s obvious that he’d like to set up an influencer relationship with them, and that he’s open to brainstorming how that relationship might look like. Because he’s open, his pitch feels less transactional and more like a business development relationship that will benefit both parties. All the influencer has to do is respond with a date and time they’d like to connect. Is your brand about to launch a new product? Or perhaps you just published some original research? Influencers love being on top of the latest trends. Make them feel like a VIP with exclusive early access to your content before it goes public. Reaching out ahead of time gives you a unique opportunity to show the influencer the kind of relationship they can expect to have with you. You’re thoughtful, considerate, and you think ahead about their needs - who wouldn’t want to work with someone like that? If you’re launching a new product or feature, you can use this variation on the sneak peek template. 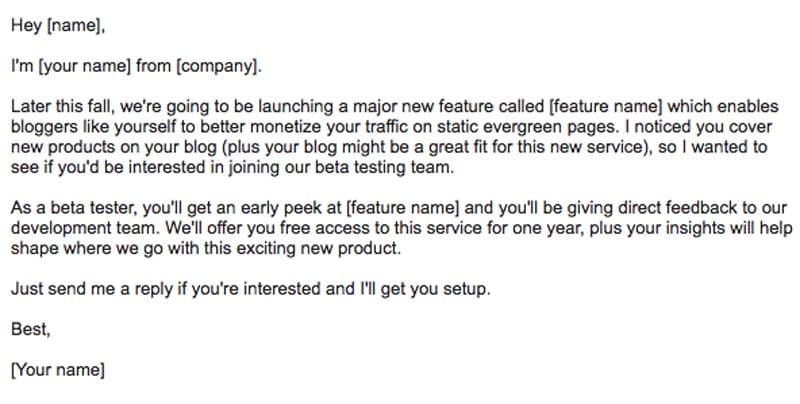 Offer the influencer not only an early look at what you’re building, but give them a slot on your beta testing team. Let them know their feedback can directly impact the direction of the product. Influencers are creators at heart, and many get excited about the opportunity to help shape the future of a new product. Here’s an example email that worked for us. The great thing about this approach is that in addition to building a relationship with a new influencer, you can obtain great product feedback along the way. This approach works well if your content is truly unique and differentiated. If you’ve compiled research, data, or findings that are interesting and pertinent to a specific influencer, simply reach out and ask for their opinion of your content. The keys here are to make it clear that you’ve got unique insights in your piece, and it’s worth the influencer’s time to check it out. As with many of the emails on this list, Tim begins his email with a compliment of the influencer’s recent work, but the outlined sections are where the real magic happens. 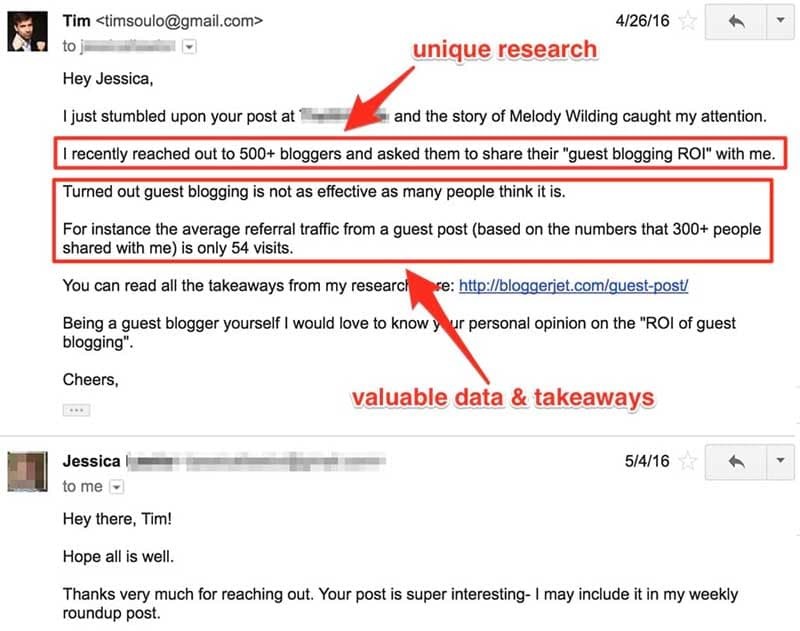 The influencer, Jessica, is a guest blogger, so Tim pulls out one intriguing statistic from his brand’s content that will uniquely pique her interest as a guest blogger. Then he strokes her ego by asking for her feedback. This approach works. Tim didn’t even need to ask Jessica to share his content. By showing how it would bring value to her audience, Jessica made that decision herself. One great way to prove your worth to your customers is by working with multiple influencers. The more influencers you have behind you, the more popular your brand looks. One easy way to show off your popularity is with a roundup post. Choose a topic, then reach out to influencers and ask them to contribute their expert opinion. This can range from a piece of advice on a frequently asked technical question to a photo showing their favorite way to use your product. 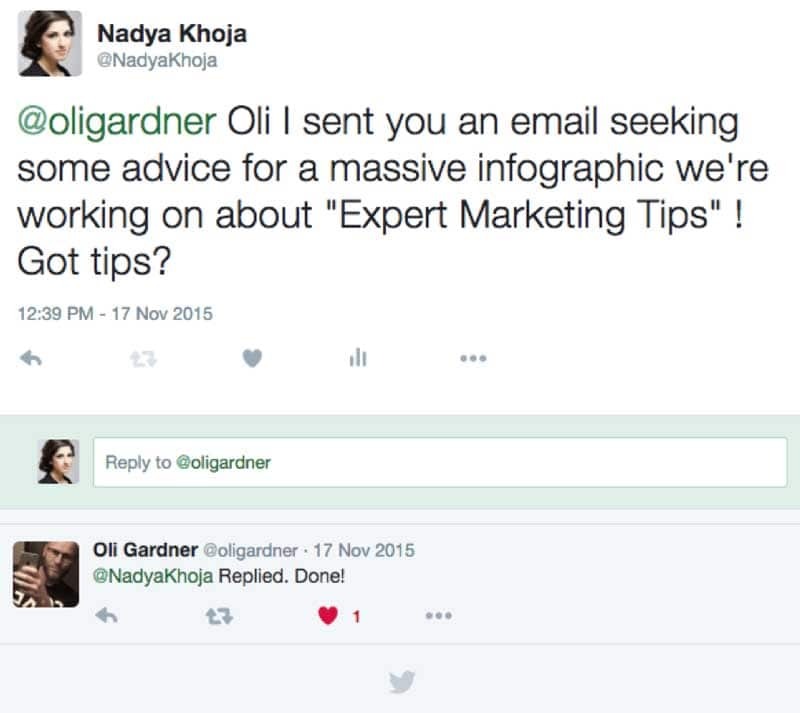 Nadya recognizes that the first step to creating a powerful outreach email is a good subject line. Her intriguing subject line (Why “is” it a happy wednesday?) that calls the recipient out by name makes her email irresistible to ignore. She further personalizes her pitch by showing sincere interest in his work. This makes her email easy to read at a glance. 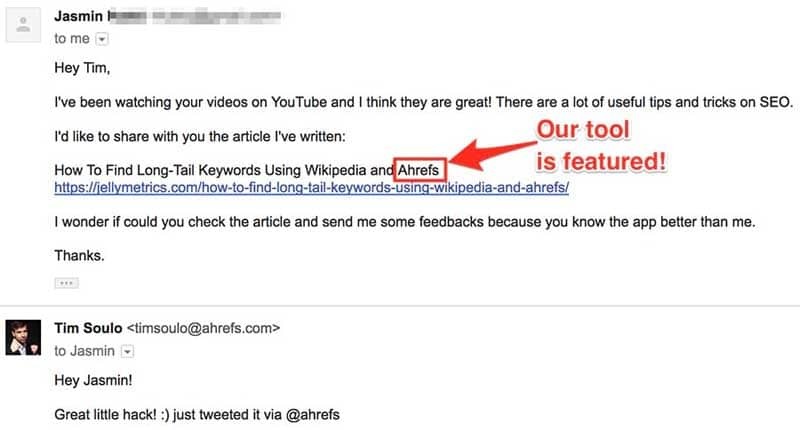 Finally, she ends her email with a WIIFM (“What’s In It For Me?”) and explains how being featured in her article will benefit the influencer. It positions him as an expert and gives him free content he can share with his own audience. 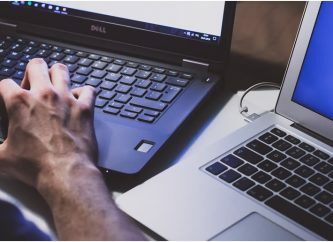 Whether you used the template above to create a roundup blog post, or happened to mention some influencers in a recent article or video, email the influencer to let them know. Featuring them endears them to your brand and is an opportune way to introduce yourself. Greet the influencer with a compliment, and link to your content that mentions them. If this is your first time emailing the influencer, you might even include a “Re:” at the front of your subject line. This little trick can help boost your open rates, as people will assume it’s part of a thread they’ve already replied to. Thank the influencer for their work and ask them if they have any feedback. Everyone appreciates the opportunity to share their opinion! Brands often provide influencers with free products in return for the influencer's hyping them up to their fan base. The request in this email is direct - your brand will provide free product in return for the influencer reviewing it. This is a pretty standard transactional request many influencers are happy to oblige. However, this request stands out by going above and beyond for the influencer. Not only will they enjoy a free sample, but so will three of their fans. You’ve given the influencer the opportunity to reward their audience for following them and further cement their loyalty. This kind of generosity could lead to a long-lasting relationship with your brand. If there’s anything influencers love more than free samples, it’s parties. Along the lines of the VIP access offered in the “sneak peek” template, networking events, meetups, and launch parties are ways your brand can assemble multiple influencers in one spot. 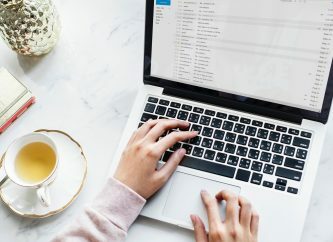 This email template makes the value of the event crystal clear for the influencer: they’ll get the chance to see and be seen, network, and pick up some free swag. Plus, they can pass on a discount code to their readers. All they have to do is spread the word about the event. The one improvement this template could use would be to personalize it and send it to individual influencers one by one, or target them by location. This approach can work in certain specific instances, but should be used with caution. Affiliate programs offer influencers commissions or payments based on new customers they refer to you. 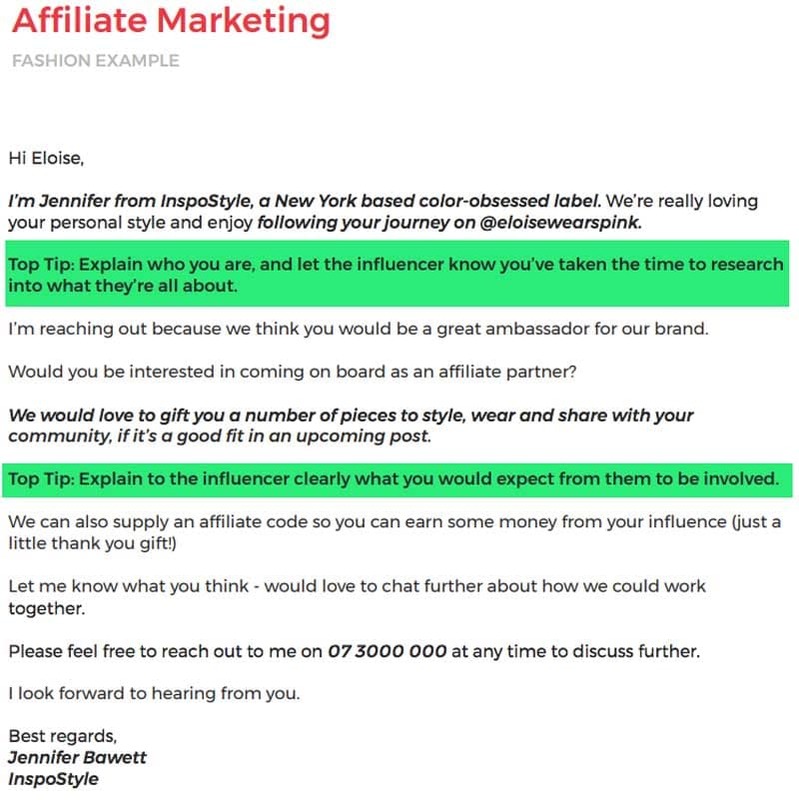 In many cases, influencers prefer to be paid upfront for collaboration projects, but if your brands really aligns well with the influencer’s audience, then an affiliate marketing approach can be highly effective. The great part about an affiliate relationship is that the influencer’s goals are aligned with yours, they want to drive sales to you, and can benefit over the long term with steady sales if they do a great job. This email reads like a personalized invitation to be an affiliate partner, and the brand representative even includes her direct phone line should the influencer have any questions. This feels specialized and genuine, like the influencer was handpicked for the opportunity based on their sphere of influence. Sometimes it takes more than one email to get an influencer’s attention. While you don’t want to pester anyone, it’s often worth your while to send one follow up email. Emails get lost, overlooked, or deleted, especially when your inbox is as full as an influencer’s. The follow-up email should remind the person of the previous email, the value you can bring, and your requested action. To tip the scales in your favor, you might further validate your request by referencing an event you both attended or a mutual connection. Bonus tip: Nobody likes to be harassed, but a friendly tweet following your email is pretty harmless. It shows you’ve truly researched the influencer and genuinely want to have a relationship with them, especially if you’ve established a history of regularly liking and engaging with their content. Hopefully, the above nine examples have given you some inspiration for improving your influencer outreach. Before you hit send, take one more look at your email. If it reminds you at all of the email below (outed by iAcquire), it probably needs some final tweaking. 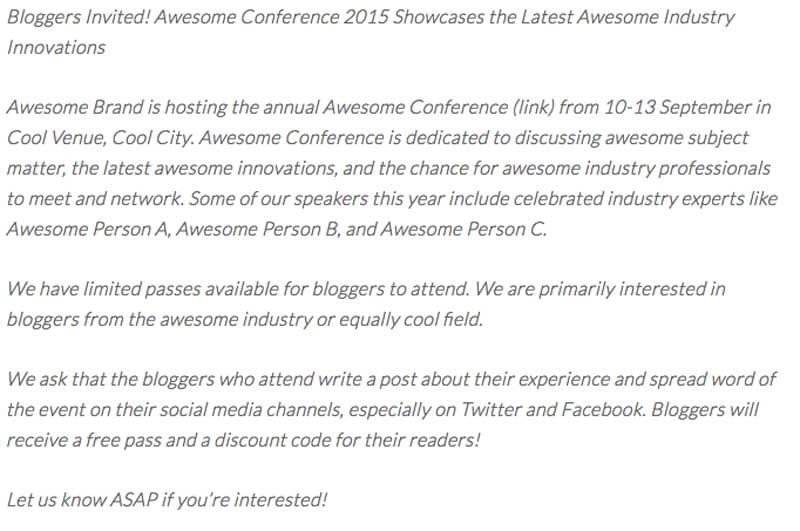 This email is clearly a template - the writer even forgot to fill out the “[blank]” and “[insert blog here]” fields. It’s hard to believe they’re truly “big fans” of the blog. Finally, it rudely demands action from the influencer, suggesting that spots are filling up and that the influencer has to adhere to their schedule by responding ASAP. Avoid emails like this. Instead, copy the approach of one of the above outreach email templates, and tailor it to your brand, the offer, and the influencer you’re pitching. 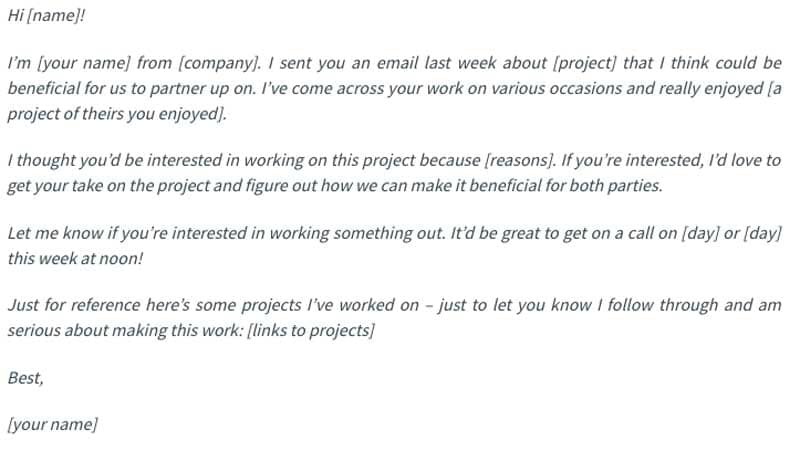 You likely noticed a few patterns as you read through the outreach email templates above. In closing, let’s review some best practices for influencer outreach. Personalize, personalize, personalize. Just as real estate is all about location, influencer outreach is all about personalization. You must personalize your email - tailor your pitch to the influencer and explain the value to their specific audience. Make it about them, instead of about you. Don’t go on and on about your company and how your product is changing the world. Instead of establishing legitimacy, this makes you look desperate (and it also bores people). Don’t demand anything. The influencer doesn’t owe you anything, and can decide for themselves whether they wish to work with you or promote your product. 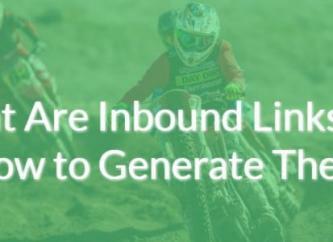 Reserve words like “asap,” “urgent,” or “now” for your landing pages. Get to the point. Make your email short, sweet, and easy to read. Follow these tips as you craft your outreach emails, and you’ll set yourself up for success. Michael Quoc is the founder and CEO of Dealspotr, an e-commerce platform that connects emerging brands, lifestyle influencers, and savvy shoppers around today’s best deals.